snowdeal.org > ex machina: the eric update - day 253: the apprentice. the eric update - day 253: the apprentice. so, i'm trying the ol' bathroom mirror portrait trick, but my grand plans are foiled because instead of being tricked into looking into the camera reflection in the mirror odin was was quite happy to play with the real camera in front of him. i was hoping that he would accidentally hit the shutter button to snap a photo, but mostly he just fiddled with the knobs and mouthed the SLR eyepiece. 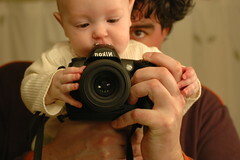 with a bit more apprenticeship, i'm sure he'll be be ready to begin the process of taking over as family photographer. actually, at first the camera was off to the side as i was attempting to get a picture with both of our faces in the frame, but that resulted in multitudes of shots of him lunging for the camera while i precariously balanced him in one hand and the camera in another. so i compromised and put the camera front and center which means you'll have to wait a little longer for a proper portrait of him and me. really, i am slightly less camera shy than i appear. but only slightly. eric, that is a simply stunning photograph. i recently perused all of odin's pics... do you guys do the same thing we do & look at the pictures & look at him and marvel at how far you've all come? sarah: do you guys do the same thing we do & look at the pictures & look at him and marvel at how far you've all come?thanks for compliment on the photograph! and yes, we do go back through the pictures and are constantly amazed at how far he's come. for quite some time we've planned on printing out a few of them hanging on the walls. but whenever we try to go back and select a select few, we can't! b.t.w. speaking of photos and documenting progress, i love your pickles the dinosaur post.